Throw Your Girl A Magical Party She'll Never Forget With This Premium Pack Of 180+ PCS Magical Unicorn Birthday Party Supplies! What makes a birthday party memorable and fun? Besides the delicious tummy-filling food, the gifts, and friends, the look and feel of the party venue plays a major role in determining how much fun everyone has. This is why we offer you the ultimate birthday party kit to help you set a magical theme for any party! The Ultimate Party Set Every Girl Loves! Celebrate your little angels big day in the most fun, magical and memorable way with this pack of 180+ PCS unicorn party decorations and supplies that include everything you could possibly need to throw your daughter her dream party! 180+ PCS - Here's What You Get! ✔10 set Unicorn tableware set - cups, knives, plates, forks spoon, straw and 20 napkins. ✔1 Unicorn table cover 70x42"
We take your feedback very seriously and constantly keep evolving our products to meet the high expectations of our customers. Our magical birthday decorations are made from premium quality materials that are non-toxic and safe for children along with being durable enough to provide long-lasting use. 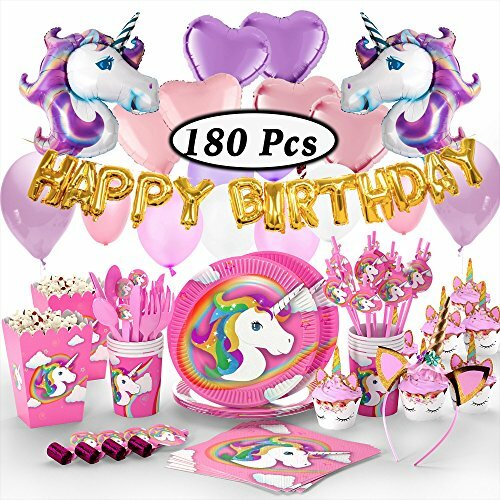 Click on the Add To Cart button now to order this unicorn pink party supplies set to throw a party that your daughter and all her friends will love! ✨THROW A MYSTICAL PARTY WITH MAGICAL DECORATIONS: Our mystical unicorn birthday party supplies and decorations are the perfect choice for anyone that wants to add more magic, fun, and style to their little girl's party and make their big day even more special. Featuring 180+ pcs unicorn birthday party decorations and supplies, this set has everything you need to make your baby girls dream party a reality. ✨180+ PCS FULL PARTY KIT: These fun unicorn party favors is what every growing girl wishes she has at her birthday party to add a touch of magic and fun. Each pack of our unicorn party supplies set includes Gold Happy Birthday Balloon Set, 24 Unicorn CupCake Toppers & Wrappers, 2 Unicorn Head Balloons, 22 Latex Balloons, 4 heart Foil Balloon, 1 Unicorn headband, 10 set tableware, Unicorn Whistles, Popcorn Boxes, Party Bags, Unicorn Table cover & MORE! ✨UNMATCHED QUALITY & VALUE: Each of our unicorn goodies, supplies and decorations are made to meet the highest standards of quality to make sure you get nothing but the finest. The unicorn disposable party plates, forks, and spoons make the perfect tableware set for any party! It's loaded with extra goodies, reusable unicorn head balloons, and heart foil balloons that will guarantee the happiness of your little girl while being incredibly affordable! ✨PERFECT FOR EVERY OCCASION: Whether you're looking for fun and stylish décor to throw your daughter the party of her dreams or just have some fun at Christmas, picnics, get-togethers, pajama parties, fantasy parties, photo booth props, outdoor events and more, you can count on our Unicorn themed pink party supplies to raise the appeal of your décor and breathe some magic into your party! ✨100% RISK-FREE PURCHASE: At Party Supply Pros, we make customer satisfaction our top priority which is why we use only the highest quality materials to make our pink party supplies and unicorn head balloon set while ensuring every piece looks absolutely fabulous! We're so confident that you'll love our unicorn birthday party supplies and decorations that we offer a 100% Customer Satisfaction Warranty so that you can order today knowing your investment is risk-free! If you have any questions about this product by FETTI FETTI, contact us by completing and submitting the form below. If you are looking for a specif part number, please include it with your message.